Discover the next generation in tools for configuration and maintenance of MiCOM – redefining MiCOM S1. S1 Agile is the next step enhancement from existing MiCOM S1 Studio, encompassing all of the traditional functionality, to become the complete successor. The move from S1 Studio to S1 Agile underlines Alstom’s R&D investment in usability: to assemble all tools in a palette for simple entry, with intuitive navigation via fewer mouse-clicks. 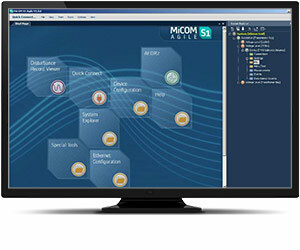 S1 Agile is the truly universal PC tool for MiCOM for the first time. No-longer are separate tools required for redundant Ethernet configuration, phasor measurement unit commissioning, busbar scheme operational dashboards, programmable curve profiles or automatic disturbance record extraction – all applications are embedded. MiCOM S1 Agile supports all existing MiCOM, K-Series and Modulex, including a utility for automatic conversion of setting files from previous generations of numerical relays like K-series and MiCOM P20 to the latest P40 Agile models. To move to the future, with no loss of functionality, no loss of device support, and full compatibility with your installed base and system architecture – request a copy of S1 Agile with the contact form link below. S1 Agile offers a fresh new look - functions and components are presented as “tiles” rather than menu items. To receive the S1 Agile, or any other MiCOM PC tools software by download, please use our Contact form. This will also ensure that you are kept up-to-date with all the latest enhancements, including updates and bug fixes.